You can now easily create these forms with Blitzen! 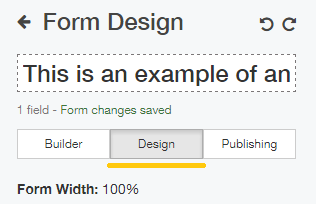 Scroll down in the right-side panel to where you see the 'form type' options. 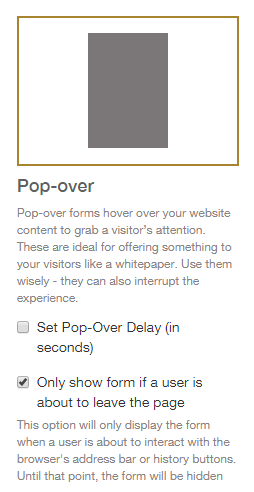 Click the 'Pop-over' option and check the box that says 'Only show form if a user is about to leave the page'. Now to add this form to your webpage, paste the embed code into your page source and you're in business! In essence an exit intent form is an average form but it has a different purpose - to grab the customer's attention one last time and re-engage a potentially lost lead. But not all exit intent forms work. What makes the ones that do work different? The answer is simple: a great intent form gives customers something they want. Let's imagine that someone came to your website, perused your content, but didn't do what you wanted them to, whether it's registering for a newsletter, buying a product, etc. Let's first consider why they might be leaving. For each of these occasions there is an appropriate exit intent form to match. Unfortunately we can never know exactly why someone is leaving a page, but depending on the context, we can make a pretty good guess. Knowing this, we can offer them something enticing. A product page would be perfect for a coupon code pop-up; a blog page is a good place for a newsletter signup, etc. Most importantly it should be short and sweet. Consider this when you are creating your own exit intent form.